Subham Saurav from Lohardaga, B.E. - B.Tech Graduate. 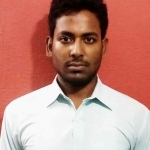 Subham Saurav is Engineer and currently have no work experience. INTERACTION AND COMM.. DECISION MAKING AND .. SELF - MOTIVATED AND.. LEADER SHIP TEAM WO.. PUNCHUAL & HARDWORKI..
are one of expert skill area's of Subham Saurav . Subham Saurav is working in IT Hardware industry.